… and TIME will play a dark and brutal game with an innocent prince. It will take away his kingdom, his near and dear ones… it will make him to meet his love only to lose her. But what happens to him at the end? But time isn’t playing tough in our case as we just have to wait till May 2010 as on that month Walt Disney Pictures is bringing to us the legend of…. Yes the name speaks for itself. He’s the prince of the gaming world. And every gamer (and the non-gamers as well) know him by that name. What he does, he does with élan… be it his vengeance for the enemy or his fierceness in fighting or his flirts with the princess everything is studded with flamboyance and utmost charm. His glory is eternal in the gaming world. This glorious character was originally penned by Jordan Mechner but the PRINCE OF PERSIA has been truly immortalised by the UBISOFT STUDIOS (the production house of the game) by their awesome graphics and digital wizardry. Though the original PRINCE OF PERSIA is a trilogy but I really don’t know how the story of the film is scripted. 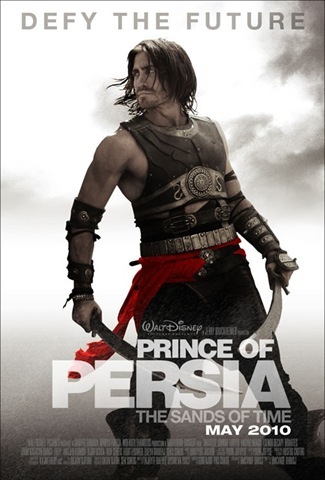 The title of the film is PRINCE OF PERSIA, The Sands of Time (same as that of the first game) but the attire of the prince as revealed in the posters is much like that in the WARRIOR WITHIN (the second game of the series).